Check Out This Product's New Low Price ... Save $25 per bottle! Nitric oxide is the key regulatory molecule for circulation and arousal, as well as plays a role in multiple immunologic and physiologic body processes to maintain healthy living and energy. 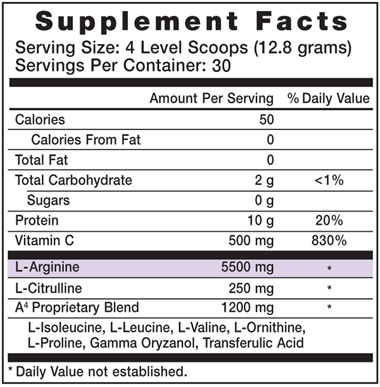 * Research indicates L-Arginine and L-Citrulline help support the production of nitric oxide*. Other Ingredients: Malic acid, natural flavor (mixed berry), chicory root extract, citric acid, ascorbic acid, silica (as silcon dioxide), stevia leaf extract. Directions: Adults: 4 Scoops Daily. (2 Scoops in AM and 2 Scoops in PM.) Dilute in 12-16 ounces of water. Take on an empty stomach. Do not consume with food. CAUTION: Do not consume if tamper resistant seal is broken/missing. Do not consume if allergic to components found within product. As with all dietary supplements, contact your doctor before use. If taking prescription medications, have an ongoing medical condition, are pregnant, nursing or under age 18, consult doctor before use. Not for use by persons with brain or ocular herpes, prostate cancer, or those with Wilson’s Disease (genetic copper disorder). Isolated vitamins or nutrients are best taken as part of a well balanced diet and broad supplement program. KEEP CAP TIGHTLY CLOSED. KEEP OUT OF REACH OF CHILDREN. I love vascular advantage! It can tell it helps my blood flow. I take it in the morning and the evening. I like the flavor and I use it as a nice drink between breakfast and lunch. I also add a scoop to my chlorophyll drink after dinner. I couldn’t be more happier with this product.